On Dwyane Wade Day, the No. 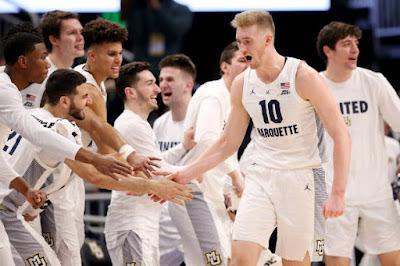 15 Marquette Golden Eagles (16-3, 5-1 Big East) overcame a sluggish shooting performance in the first half to defeat the Providence Friars (11-7, 1-4 Big East), 79-68. Here are my five things to take away on a special Sunday at Fiserv Forum. Providence dictated the pace in the rebounding department with a 43-31 advantage on Marquette with 15 of those coming on the offensive end, while the perimeter game left a lot to be desired going 4-of-19. Despite the totals, the Friars received their fair share of open looks, but failed to deliver as coach Ed Cooley took ownership. After a career-high 31 points at Georgetown on Jan. 15, Sam Hauser followed up with a game-high 25, on 8-of-13 from the field. Hauser did not start off as flashy as the previous game as he went the first 13:38 without a point. The second half witnessed Hauser pick apart Providence’s defenders on the left post as he converted multiple baskets. Joey Hauser even got in on the act with a few makes as the brothers scored 19 in a seven-minute stretch in the second half. “Sam is incredible. One of the top players in the country and has stepped up for us in the last two games in a monumental way. We don’t even come close to winning this game without him,” Golden Eagles coach Steve Wojciechowski said. Freshman Joey Hauser added 11 points, with eight of them in the second half as Wojciechowski relished in watching the brothers’ rapport on the court. After leaving the Georgetown game with a back injury, Markus Howard returned to the starting lineup and finished with 24 points, on 14-of-16 from the free-throw line. Howard did not practice the last five days, which left a lot of unknowns as to how he would respond. Cooley was glad to see Howard play and always wants the best players to play. A positive sign for Providence was the play of center Nate Watson with a team-high 21 points. The majority of Watson’s points came in the second half on layups in the paint, which kept the Friars around in the second half after a blown nine-point lead in the first half. Wojciechowski recognized the job Watson did in the post and how it caused problems for the Marquette defense in the second half. “He’s a hell of a player, He’s wide and strong, plays really hard. They did a nice job of feeding him and established the post position,” Wojciechowski said. Milwaukee Mayor Tom Barrett presented the proclamation, which declared Jan. 20 as Dwyane Wade Day across the city of Milwaukee during halftime festivities at center court. Wojciechowski and Sam Hauser were glad to have a player of Wade’s credentials return to be honored.